Draft week is upon us and in a few short days, 256 athlete’s lives will changes forever. Whether a player selected in the first round or at the tail end of the seventh round, we at Pro Football Focus can tell a unique story of them all. Grading every player on every play of every game, our database is seemingly endless with our exclusive PFF signature stats as well as our proprietary grades and so much more in between. With our eyes firmly set on the 2018 NFL Draft, here are stats that you cannot get anywhere else on some of the draft’s marquee names and players who may be less-heralded to some. 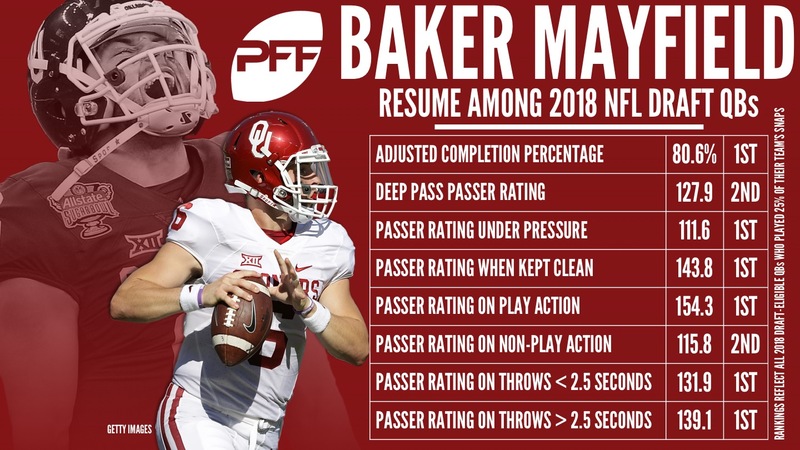 Oklahoma QB Baker Mayfield had the draft class’ top passer rating on passes under pressure (111.6), from a clean pocket (143.8), with play-action (154.3) and on throws within 2.5 seconds (131.9) and 2.6 seconds or longer (139.1). Over the last two years, Mayfield has posted a red zone passer rating of 114.7, the best mark among quarterbacks with at least 50 red zone attempts in that span. Wyoming QB Josh Allen notched a passer rating of 116.9 when targeting his receivers in the end zone in 2017, which is the best mark among the draft class. In 2017, Allen had 68.9 percent of his yards come through the air, and only 31.1 percent came after the catch. When blitzed in 2017, Toledo QB Logan Woodside put up an adjusted completion percentage of 81.6 percent – the best mark in the draft class. Among draft quarterbacks with at least 150 attempts, USC QB Sam Darnold had the lowest percent of his catchable passes dropped (3.5 percent).